I just received an email from a self-described fiberholic who is going to the Languedoc area in France very soon. 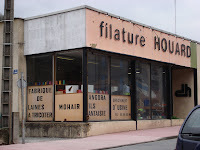 She wanted information on Filature Houard. Unfortunately, just a few hours before, I had received an email from Laurence a.k.a. LaineZinzin -- who vacations in nearby Bedarieux in the summer -- and she reports that Filature Houard finally closed down for business August 15. Monsieur Houard had been trying to fight the imminent closure due to bankruptcy since last summer. He went to court last October and the factory stayed open for 10 more months. I'm glad I was able to go to the shop at least once. It will be missed by spinners and knitters. 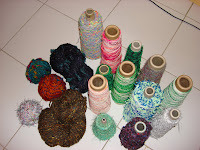 The machines of the factory churns out fabulous threads and yarns. Let's hope someone or some entity will take a financial interest in it.